Luzli’s Roller MK02 headphones are inspired by luxury Swiss watches | What Hi-Fi? 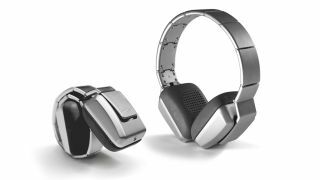 Swiss high-end headphone brand Luzli has today added a third pair of headphones to its affluent arsenal, the £3840 Roller MK02. The new pair, and the Roller MK01 (£2880) and Roller MK03 (£4800) models it sits between, are distinct in their machined metal aesthetic, which, as intended, does visually reflect the revered luxury Swiss watch. Fingers crossed they also have the sonic timing of one. The headband is made from pure aluminium and stainless steel, the replaceable ear pads are foam, and three years of R&D is behind their 40mm custom dynamic drivers. As with its siblings, the hand-made MK02 features a patented roll-up headband design – made up of several watch-like ‘links’ – so they can fold up into a small ball. This make-up of multiple links and springs also supposedly aids flexibility when it comes to fit. The MK02 comes in silver and is available now from Luzli.